Walk into Cynthiana First Church of God in Cynthiana, Kentucky, on the third Sunday of the month and you might be surprised to witness something a bit different than a typical sermon. In fact, you may be watching a group of energetic kids cheering for God’s love, or water being poured over a youth pastor’s head onstage. 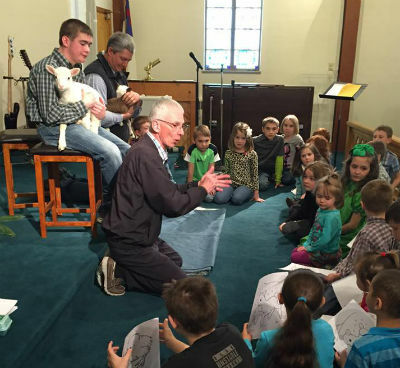 Once a month, Cynthiana First Church of God gets children actively involved in sharing a lesson with the rest of the congregation. These messages, dubbed “Kidz Mess,” are kid-friendly sermons that keep youth and children engaged with God’s Word. When Pastor Earl Litman began pastoring at Cynthiana First Church of God ten years ago, only a few children were among the congregation. He felt God moving him to take action to attract more families to the church. “I knew that to keep the kids and families coming, we had to do more for our children’s’ ministry,” Earl says. Earl Litman isn’t afraid to get silly to keep their attention. However, beginning a children’s ministry program wasn’t as simple as it sounded. 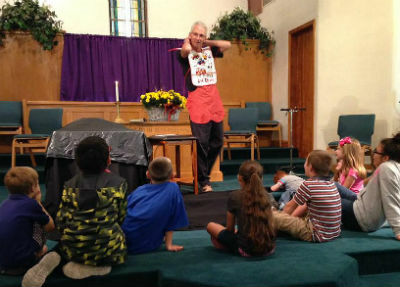 The church lacked youth leaders to conduct the children’s program on Sunday mornings during regular services, so Pastor Earl decided to improvise. “So I said, since we cannot get anybody [to teach the children] on that Sunday, I will bring all the kids to the platform and do a kids message, and make it so the adults can get something out of it, as well,” Earl explains. Although Kidz Mess was met with some skepticism when it began a year and a half ago, it is now often the most well-attended service of the month. 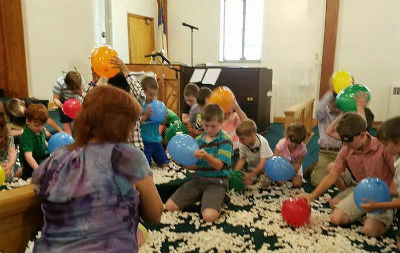 Even adults in the congregation seem to enjoy the unusual service, and look forward to its creativity and the contagious joy of the children who are allowed to participate in sharing a lesson. Some Sundays, up to forty kids will participate in the message. Recently, Pastor Earl focused his Kidz Mess on the concept of trusting in God. As part of the lesson, he poured a glass of water and held it over a participating youth pastor’s head before asking if he trusted in him. As the children gasped and cheered, Pastor Earl then pressed a card to the top of the glass before tipping it over the youth pastor. To the children’s surprise, the card remained suctioned to the glass, preventing the ice-cold water from dousing the stage. The presentation proved the power of trust to the audience. It’s okay if the sanctuary gets a little messy! Pastor Earl says that in order to run a successful children’s ministry, it is crucial to have a support system. “It takes an army,” he says. “Often, it’s a lot easier to put together a sermon than a kid’s message.” Earl receives assistance from volunteers who help keep the children in order onstage and provide materials for the lessons. He also receives help planning activities for the Kidz Mess from his wife. In Cynthiana, Kentucky, across North America, and around the world, God is on the move in the Church of God. Join the movement. Reach our world. Donate today at give.jesusisthesubject.org. This entry was posted in All Church of God, Southeast and tagged children's ministry, Cynthiana, discipleship, Earl Litman, ideas, innovation, innovative, Kentucky, kids, Kids Mess, Kidz Mess, KY, Noel Marquis, young, youth. Bookmark the permalink.